How A-Political Was the National Rifle Association Before The Cincinnati Revolt of 1977? I confess that I have always been jealous of historians and historical sociologists because their wide field of vision offers so many insights into the present. Good history helps us see where we came from, and how the present day is or is not different from the past. Total immersion into a previous time period must be an amazing intellectual experience, and those who can convey what it was like to be living in that earlier time are remarkable. I hope my own work analyzing gun advertising in The American Rifleman over a 100 year period will give me some insight into how American gun culture has changed over time, but I am also very aware that a little bit of knowledge is a dangerous thing. For example, I am not a historian of the National Rifle Association as an organization. I have observed, however, a common narrative that the NRA was founded as an a-political marksmanship organization and remained so until the 1977 Cincinnati Revolt which transformed it into an extremist gun lobby. The organization, about a century old already [in 1977], was thoroughly mainstream and bipartisan, focusing on hunting, conservation and marksmanship. It taught Boy Scouts how to shoot safely. But the world had changed, and everything was more political now. The rebels saw the NRA leaders as elites who lacked the heart and conviction to fight against gun-control legislation. There’s no question that a struggle over the direction of the NRA took place in 1977, but in looking back through old issues of The American Rifleman, I cannot help but question this simple narrative. And apparently have done so for some time. 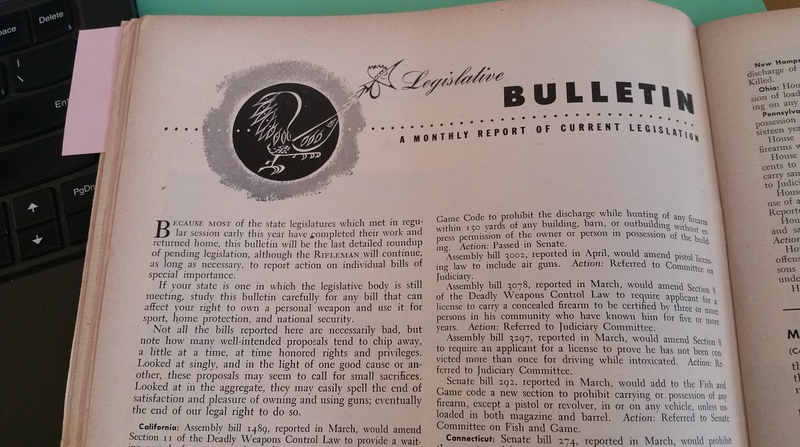 The Legislative Bulletin in the June 1951 issue also has interesting comments in its preface to the bills being introduced in various states. After noting that many state legislatures had already adjourned, it encouraged readers in states still in session to “study this bulletin carefully for any bill that can affect your right to own a personal weapon and use it for sport, home protection, and national security.” Although personal protection outside the home is not specifically mentioned, home defense is clearly seen as a motivation for owning a personal weapon, as is national security! A.k.a., The Slippery Slope! The argument was not invented by Harlon Carter, Neal Knox, Charlton Heston, and Wayne LaPierre. For most of its history, the NRA completely ignored the Second Amendment. 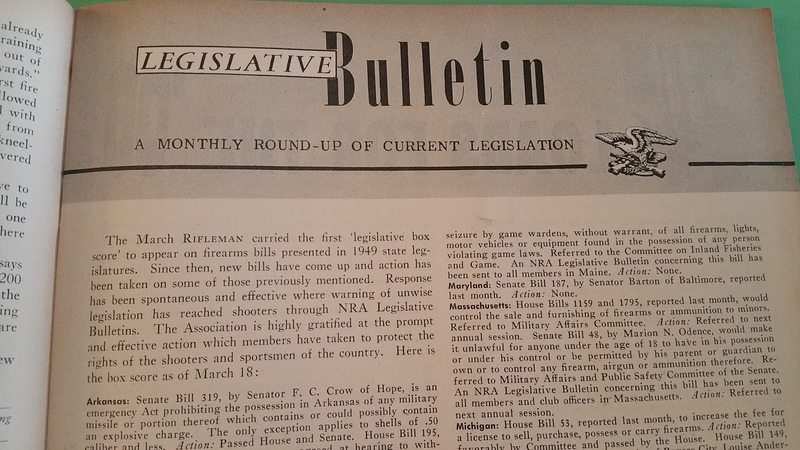 If you go through old issues of the NRA’s signature publication, American Rifleman, from the 1940s and 1950s, you can read issue after issue without finding a single mention of the Second Amendment. The organization was focused on marksmanship and hunting, not shooting down gun control. I usually like Winkler’s work. I even called his book Gunfight “the best single-volume treatment of guns in American history” and I assign it to my Sociology of Guns students every semester. A charitable reading would say that Winkler was really talking about where the priorities of the organization were at the time. And I would agree that the NRA’s emphasis on the Second Amendment was less in the 1940s and 1950s than it is post-Cincinnati. But so too were the threats to the Second Amendment in the 1940s and 50s. Less charitably, Winkler makes an empirical claim (albeit in the second person) about going through issues of The American Rifleman in the 40s and 50s and not “finding a single mention of the Second Amendment” which is simply false. 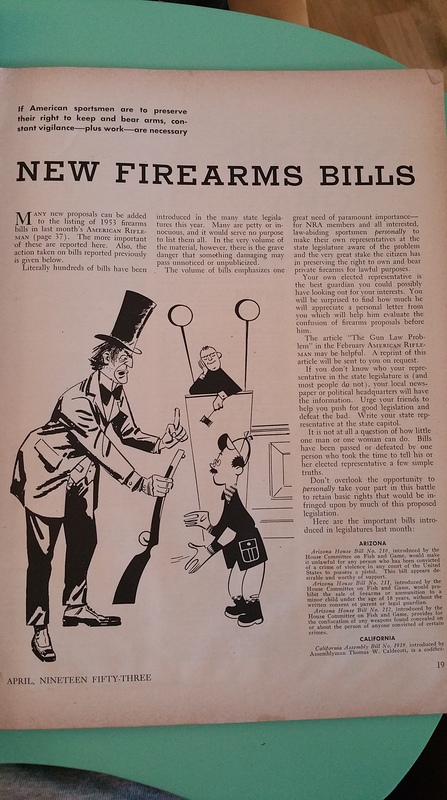 I looked at just one issue of the magazine from 1949, 1951, and 1953 and I found mention of the Second Amendment in every one, if we consider references to “your right to own a personal weapon” (1949) and “our legal right” (1951) as references to the Second Amendment. Where else would the right come from? If American sportsmen are to preserve their right to keep and bear arms, constant vigilance — plus work– are necessary. As in 1951, the column recognizes that “hundreds of bills have been introduced in the many state legislatures this year” and that many “are petty or innocuous.” There’s that mainstream, bipartisan attitude again! BUT, as before, the cautionary flag is waved from the start: “In the very volume of the material, however, there is the grave danger that something damaging may pass unnoticed or unpublicized. 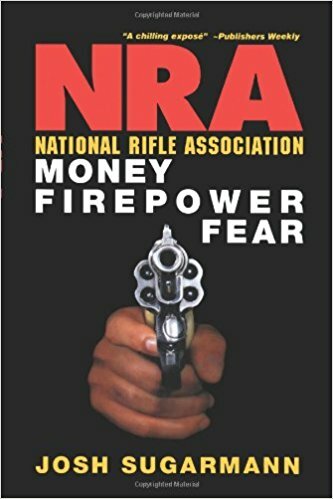 The volume of bills emphasizes one great need of paramount importance — for NRA members and all interested law-abiding sportsmen personally to make their own representatives at the state legislature aware of the problem and the very great stake the citizen has in preserving the right to own and bear private firearms for lawful purposes. As anyone following my project knows, I am NOT saying nothing has changed in American gun culture over time. The fact that home protection is mentioned but not personal protection outside the home is significant, as is the frequent reference to sport and sportsmen. But to the extent that the political aspect of the NRA has changed, how much of the change is explainable in terms of the increasing scope and intensity of gun control efforts to which the organization has had to respond from the 1960s forward? Also, if the NRA became more closely aligned with one party than previously, how much is that due to the fact that anti-gun sentiments became more closely aligned with the other party than previously? Tags: Adam Winkler, gun control, gun rights, National Rifle Association, politics, Second Amendment, The American Rifleman, Washington Post. Bookmark the permalink. I started reading the American Rifleman in the mid 1960’s when my stepdad joined. If I recall correctly, the NRA had to start playing defense harder when the gun control movement began its own harder efforts to control and regulate guns with the 1968 Gun Control Act following the multiple sixties assassinations. Much was made of the fact that Lee Harvey Oswald bought his Carcano via mail order. My thinking has been that the two sides have forced each other into harder line positions. I’m especially critical of Democrats like Sen. Feinstein and her AR bans, etc., which Winkler has pointed out are long on style and short on substance. If the NRA was not always fighting with Everytown et al, I suspect it could spend more time on gunsport and on today’s somewhat oversold passion, having us all walk around town with our concealed weapons at the ready, which is, unless one is “being stupid or hanging around with someone who is stupid” (or living in Albuquerque) statistically, unlikely to be put into play, as Papachristos et al have posited. I just finished a letter I sent to Albuquerque Mayor Berry in which I pointed out that the dysfunction of the Bernallilo Co DA’s office and court system, which has created a thriving revolving door system for violent felons (reference this Sunday’s Albuquerque Journal) leaves the common citizen no choice but to “not leave home without it” and I made clear I was not talking about our American Express cards. One thing to note about “personal protection outside the home” is that just because it isn’t talked about, doesn’t mean it didn’t happen. If there are laws against it most places, then national ads won’t talk much about it. Though look at those ads for, and numbers sold, of concealable firearms, possessed then as now of features not needed for home defense. Anyway, if the chance of getting caught and the consequences for breaking those laws (for you) are small, and the laws have a perceived social good when limited in enforcement against “those kind of people,” then all involved, the law-abiding and law enforcement, have no reason to upset the apple cart. It is only when laws targeted at the uniformly agreed-upon “bad element” begin to be applied against “decent people” that the push-back from those decent people begins. Which is in large part what we see in the Cincinnati revolt, coinciding with the increased gun control measures of the ’60s, as those laws started actively impacting the rights of the law-abiding to a degree no longer offset by the perceived social good. After all, “those people” were now getting slaps on the wrist and being cheered in media so why am I suddenly getting called a “bad guy” for wanting to protect myself and being denied the means? This was still the era of the local cop on the beat, not yet sequestered in a prowl car changing locations in the city by shift, who knew the people on his beat, the “good people,” of any race, who were where they were supposed to be, doing the things they were supposed to do. Those people, being “good people,” would likely not face many, if any, real consequences for technical violations of gun laws, if their violation ever somehow came to light. * Carry on airplanes wasn’t made illegal until the late ’60s, and was only uniformly enforced (much less enforceable) after magnetometers were mandated in ’73. Back then no citizen would calmly submit to a search by some security guard. Anyway, as you say, context is key. Before you spend 6 months mining a new ‘gun culture’ vein called concealed-carry, perhaps you would take a look at the Heller 2008 decision which is explicitly based on the American ‘tradition’ of using handguns for self-defense. I knew Scalia slightly and he figured this one out without ever reading American Rifleman.